100 peaks in 100 hours, is it possible? "Can you clarify what you mean by non-stop?" We sat in a coffee shop, respective laptops open before us. I felt old and slow, sitting next to Nick Hollon's lanky frame, which bristled with energy and focus. He had emailed me, wanting to obtain some insight on tackling San Diego's 100 peaks. He hadn't realized that I had recently attended one of the Gut Check Fitness workouts which he had trained. I had returned from 3 years in Santa Barbara with a shaved head and a beard, looking nothing like my videos and previous selfies. It had been a great workout. I knew who he was, though. News of his exploits had gotten out, as we shared the same friends, mostly from Gut Check Fitness. The most impressive of Nickademus Hollon's exploits, to me, is his finishing the Barkley Marathons in 2013. Go ahead and Google it, I'll wait. This race has bettered one the toughest people I know. Since it's beginnings in 1986, there have only been 16 finishers. Nick is one of them. He also completed the Badwater Ultramarathon in 2009. At age 19. You can Google that one, too. What information could I possibly give him on hiking 100 peaks in San Diego? After all, I started this blog in 2009 and still haven't completed all 100 of them. I've only done 71 to date. "How fast does a dedicated person typically complete the list?" he asked. "Retired people can get them done in a year, but it varies widely. I'm still not done with all 100." I answered. "How about non-stop?" He asked. This is about the time when I asked him to clarify what he meant by non-stop. It turns out, he was making the entirety of San Diego County a giant endurance race. He wanted to summit all of the San Diego Chapter of the Sierra Club's 100 Peaks List. Without stopping. Sure, he'd be supported, so he could do point-to-points. He'd be able to catch a few winks slumped in the back seat of a car that drove from one trailhead to another. But pretty much non-stop. This is when I realized why he reached out to me. He knew how long I had stared at maps of San Diego County and dreamed. He knew how many hours I'd spent on the road in the early darkness, aiming for remote peaks few people visit. He knew how many miles I'd hiked, both on well-defined trails, as well as zig-zagging up desert hillsides, dodging cacti along the way. How do you scale that lengthy exploration into a non-stop ultra-marathon? I thought about it for a few seconds. "Two weeks," was my initial response. In my mind were the countless miles of cross-country desert peaks and driving on dirt roads around the county. 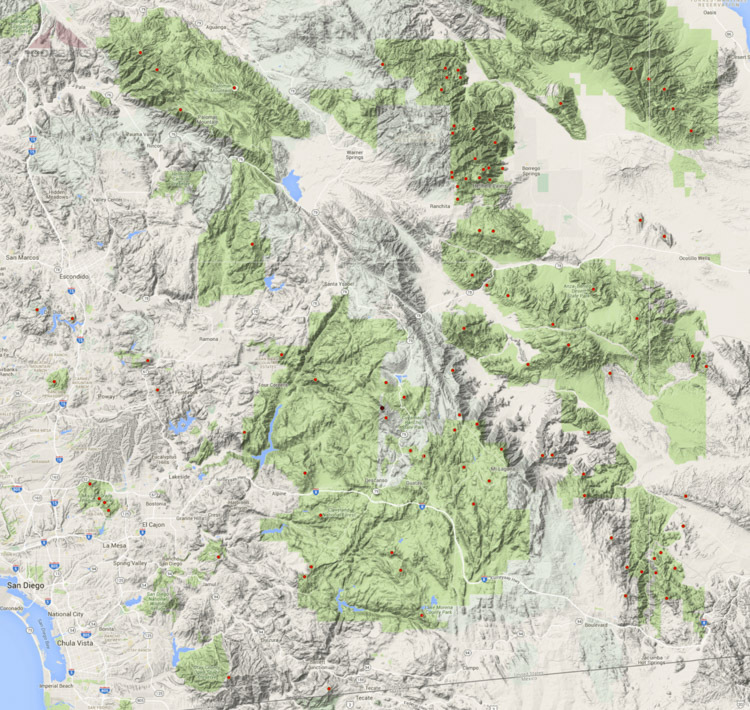 Sure, some time could be shaved off for some of the drive-up peaks, like Boucher Hill and Palomar Mountain, but, glancing back to the map before us, what we called "The Villager Group" would take a large chunk of time, just by itself. To be thorough, we started sifting through the peaks, and realized a lot of them could be grouped together in 24-hour increments. We went through every peak and thought about loops vs point-to-point. Having organized car support would be crucial, as well as communication while on the trail. Knowing his level of athleticism and drive, I shaved his time down to 7 days. One week, to drive and run all over the county and connect the dots of all the peaks. "You're awesome, Nick, a machine, but seriously, there are a lot of challenging desert miles with route-finding required. I don't even know if 7 days is possible. But if anyone could do it, it's you." And that's how we left it. A list of 100 peaks, broken up into 7 days of running. We corresponded online for a while, until I saw his post on the Team Inov 8 blog. He wanted to do 100 peaks in 100 hours. I did the math. In just over 4 days, they wanted to do what I thought would be pretty challenging in 7 days. He has paired up with Mike Trevino, another tremendous endurance athlete, who finished second in the Race Across America in 2004. They've added up some numbers. It would be 408 miles and 180,000' feet of elevation gain. And loss. Nick said it himself in his blog post about the 100 in 100, "Even on flat ground, that would be an accomplishment." I completely agree. I think about Leor Pantilat’s Supported John Muir Trail Fastest Known Time in 2014, in which he did 223 miles in just under 80 hours. Sure, the elevation was higher, but that was all on trail. 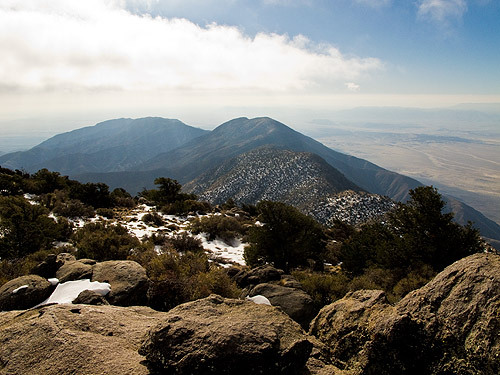 The John Muir trail is very well-defined, but the route to Rosa Benchmark or Mile High in Anza-Borrego won't be so easy. Leor averaged under 3 miles an hour, and came up with a record. Mike and Nick would have to average 4 miles an hour over cross-country desert routes. If anyone could do 100 peaks in 100 hours, it would be Nick and Mike. In the post I mention above, Nick and Mike reference "roughly" 100 hours, which gives them some wiggle room, and they won't be counting drive time. But still. What we called the Villager Group would likely take most of a day. And that's just 5 out of 100 peaks. 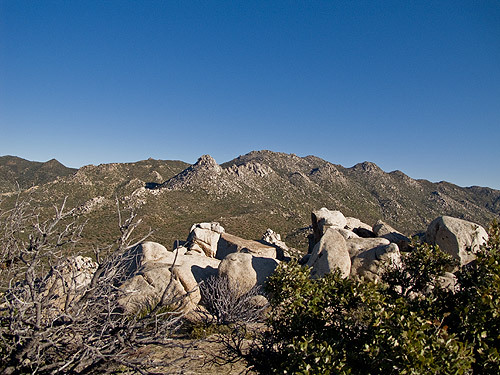 Then there’s the San Ysidro Mountains, which contain 10 of the peaks, but the terrain is completely unforgiving. Whatever the outcome to their endeavor, I will no doubt be impressed at what they will accomplish. What is also pretty cool is that their attempt at 100 peaks in 100 hours is designed to raise awareness for an organization called Nutrition Science Initiative, which, according to their site, "is to reduce the individual, social, and economic costs of obesity, diabetes, and their related diseases by improving the quality of science in nutrition and obesity research." I can get behind this. They are still working out some of the details, such as logistics and how to donate. For now, the best place to get information is their 100 in 100 website. Raising awareness of the San Diego's 100 peak list, going after a crazy feat of human endurance, as well as getting exposure and support for scientific research? I'm hooked. I'll help any way I can.